London and Zagreb and works on projects worldwide. The designs for the stunning boutique hotel gave Atellior the opportunity to pull on the beauty of its location in Opatija, a popular year-round Middle European riviera resort, for its inspiration. Atellior has used layers, textures and opulent tones of velvety deep red, Gold Calacata marble and Black Travertine stone with brass to give the Spa experience its truly indulgent atmosphere. A functional, but still luxuriously designed, fully equipped conference room is also available. 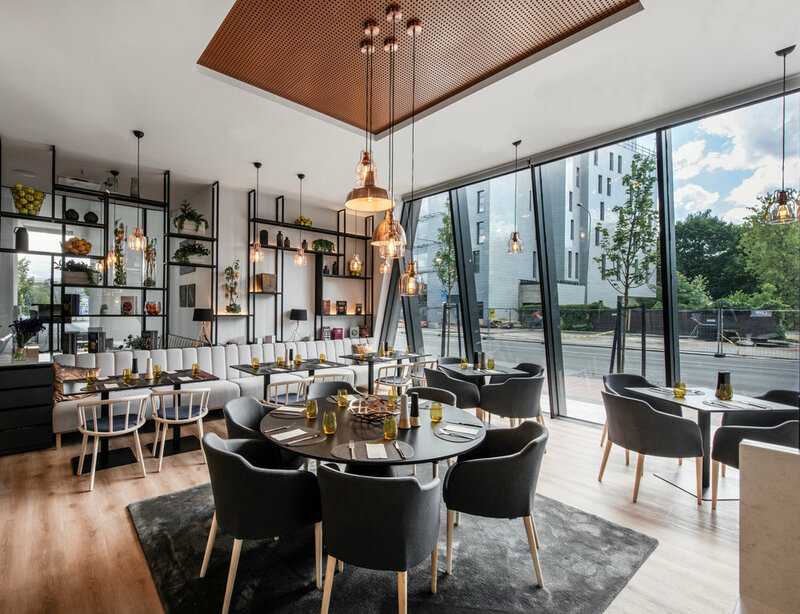 Mix Interiors latest round table assessed some of the pressures that the design community is under when the key objective is to land the job but still aim to provide a sustainable solution. So, suitably surrounded by sponsor Cosentino’s beautiful and sustainable products – who were generous enough to take over their Old Street showroom for this round table - the pannel began by discussing the real meaning of sustainability from esteemed panel’s eyes. Croatian journalist and TV presenter Mia Kovačić talks with Una Barac and Ante Maric, founders of Atellior, about a couple of their recent projects in the UK. 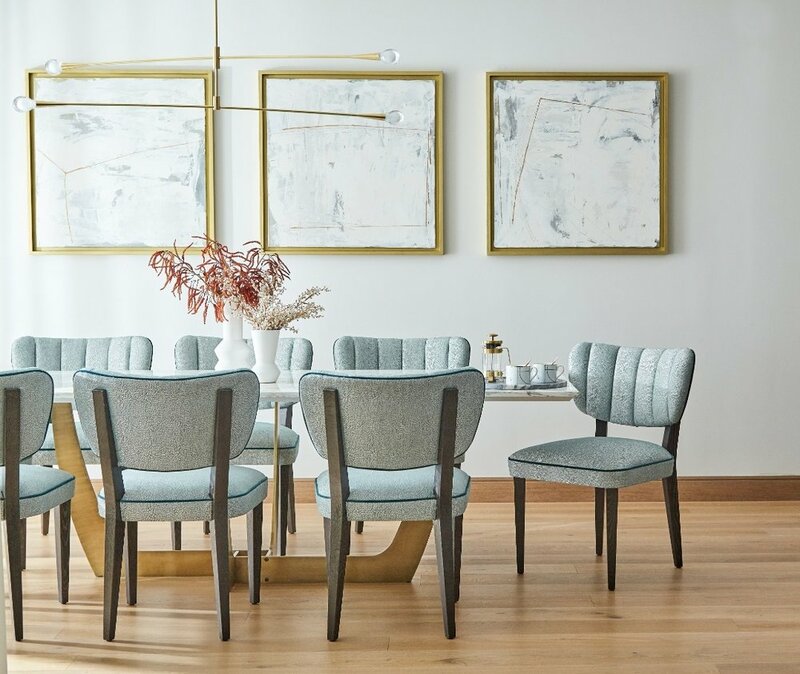 Una and Ante opened the doors to The Balmoral and Fulham Reach, two luxurious and beautifully appointed London penthouses, which are the work of internationally renowned design studio Atellior, with offices in London and Zagreb. The Balmoral is located at the prestigious One Tower Bridge Development, near notable landmarks as The Tower of London and the London Assembly. With such iconic surroundings the interior, with its floor to ceiling windows, had to blend effortlessly into the surroundings. Furniture is striking but not dominate, fabrics are bold but calm. In the Master Bedroom, bespoke Italian wallpaper was incorporated into the headboard to amazing effect. Artelior worked closely with London artisan furniture manufacturers to make unique one-off pieces of furniture. Una and Ante also worked with a Croatian specialist joinery company to create unique pieces using the finest Italian stone, oak, veneer and brass. Fulham Reach is situated in the west of London near Hammersmith. The ambiance of the place matches this great location with countless bars, restaurants and theatres. The 3-bedroom penthouse that Atellior created is breath-taking. Again, inspiration for the interior was taken from the surrounding landscape. Striking curation of artwork adorns the walls, the use of brass in mirrors and lamps adds warmth and tonal hues give an air of relaxation with the open plan living area creating the perfect setting for entertaining. Comfort is key in the design of all boutique, lifestyle and upscale hotels. Business guests face gruelling travel and meeting schedules, giving them very little time to relax and restore their energy levels. On top of that, they are far from home and loved ones, often travelling alone so, their needs will often be different to those on holiday. Holidaymakers are looking for some much-needed rest and relaxation. Even if they are busy exploring the local sites they need to recuperate once they return to the hotel. At Atellior we aim to provide all guests with a great night's rest in comfortable beds. Fabulous showers are now really key as guests often don't have the time for a long bath! Welcoming public areas with good F&B provision; and space to work, exercise and relax are crucial. Comfort is at the epicentre of all the aforementioned experiences and hotel zones. It is imperative that the guests are feeling comfortable both in terms of ergonomic design of facilities and furniture. But comfort also extends into the service that is provided. We work closely with the owners and their operating teams to enable them to provide high levels of service and ultimate comfort for their guests. • F&B is the heart and soul of every successful hotel. Open-plan, welcoming, allowing fluid interaction between different zones; In order for every experience to be memorable and unique F&B explores different cultures through fusion. We work closely with the hotel owners and operating teams to link our design to all aspects of the F&B design. Design is not just spatial planning and FF&E; Good design connects to the F&B offering, menu, staff uniforms through to the music that is played in the public areas. • MICE is not just a revenue generator for large brands. Boutique and lifestyle hotels have a lot to offer to smaller, less corporate clients, which are on the rise along with the growing number of start-ups, entrepreneurial, tech and creative businesses. Team building can no longer afford to be a corporate chore, but instead it needs to be a unique experience one finds in a Members Club. Weddings, parties, celebrations all need to be memorable and unique. • Spa should not be a box-ticking exercise with small pool, sauna and treatment rooms banished to the depths of the basement. Space planning with a good spa consultant needs to be integrated with interior design; functional spaces; different facilities and treatment offer, all focused on a high level of service that gives the guest a memorable experience. • Service is critical for a satisfied returning guest. Exceptional and personable service provides the guests with unique and memorable experience. Without good service no amount of money spent on the building will encourage a guest to return to a hotel. • Technology is becoming an essential part of hospitality service. We work from home, hotel room, lobby, bar, restaurant, on the go. The world has become our office; we increasingly socialise through our phones, our tablets and laptops. These devises have become almost as essential as having food and drink, sadly. Time is becoming more precious and guests expect faster and smoother service in terms of check-in and check-out. Intelligent rooms and buildings provide guests with all necessary comforts, they also assist in smoother operations of the hotel, and monitor energy saving for example. Our vision for Carlyle Penthouse at Lockside House was to create a unique interior that reflects both the elegant architecture and the water-features of Chelsea Creek. For inspiration we looked to the River Thames and the meticulously designed waterways and landscape surrounding Lockside House, in order to bring soft, shimmering colours and textures into this spectacular penthouse. The unique vicinity of the Kings Road with it’s amazing shops, bars and restaurants inspired us to create a stunning West London home, that combines European chic with timeless British elegance. Chelsea Harbour and the furniture and lighting hub of Fulham Road provided us with plenty of quintessential British design inspiration. We worked meticulously with local, London based artisans in order to create a bespoke collection of furniture and lighting. We took great care to procure the artwork and the leading art consultancy we worked with, helped us create an immaculate collection of contemporary paintings, artistic photography and historic prints, richly layering and complimenting the overall interior design scheme. A selection of large paintings were commissioned especially for this penthouse reflecting the exceptional standard that St George achieved at this Chelsea Creek development. At the heart of our design was the aim to create a unique home that is both welcoming and stylish but above all provides life’s necessities, comforts and luxuries. Alongside spectacular interiors we gave special attention to the generous terraces, which provide additional entertainment and relaxation space, connecting this unique penthouse with meticulous architecture and landscape of Chelsea Creek. Impression Magazine wanted to hear from businesspersons and designers about their thoughts on the perfect hotel, how and why perceptions of perfection vary depending on the hotel's guest profile. Una Barac, the Executive Director of Atellior assisted in the article with her impressions. 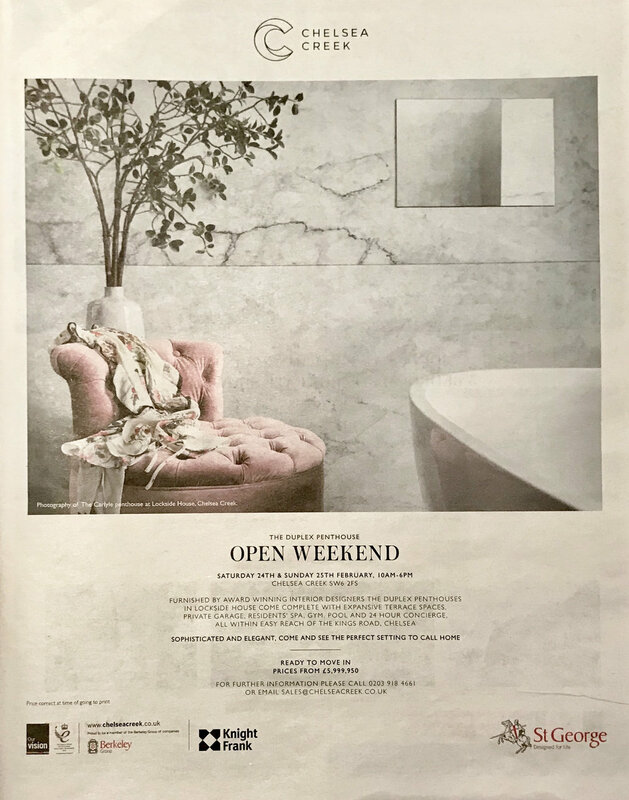 Proud to see our new project, Carlyle Penthouse at Chelsea Creek for St George in Sunday Times. MGallery by Sofitel Sarajevo, with interiors designed by Atellior, wins Best New Hotel Award at REXPO. REXPO 2017 - The International Fair of Investment Projects, which was held for two days, 30 November - 1 December 2017, at the City Plaza Centre in Zagreb, once again hosted the investors, developers, contractors, designers, architects, banks, investment funds, hoteliers, representatives of ministries, countries and cities, media and the other stakeholders interested in the development of public and private investment projects. UK was a partner country confirming that British investors see REXPO as a platform which will enable them to get information about the investment opportunities in Croatia. The focus of REXPO Forum was on the potentials and projects of luxury tourism developments in the Alps – Adriatic region and the trends in hospitality projects. 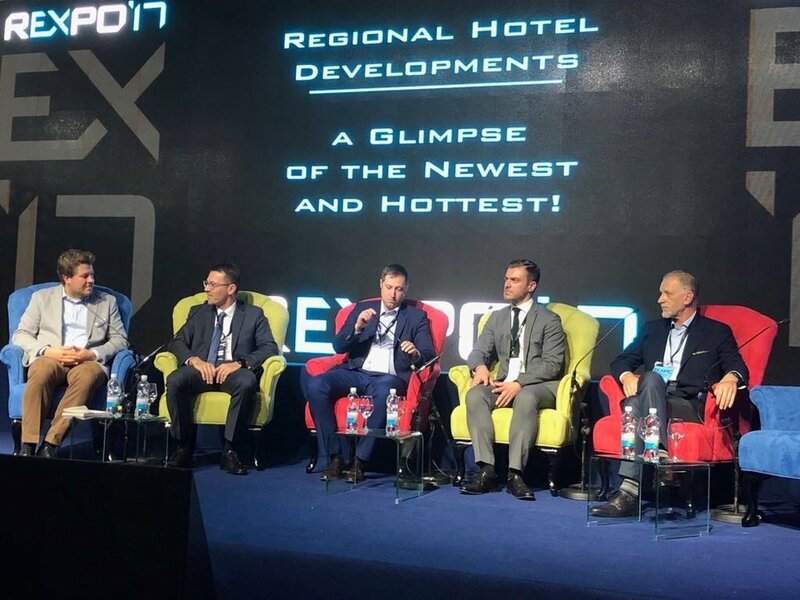 Ante Marić, Managing Director at Atellior was a speaker on the panel Regional Hotel Developments; The Glimpse of the Newest and the Hottest moderated by Sebastian Krueger from PKF hotelexperts together with Nikola Avram from MK Hotels Branko Baica from Project Nikola Zablace and Ronald Korotaj. The fair was closed with the REXPO Best New Hotel Award 2017. This year award went to Tarčin Forest Resort & Spa MGallery by Sofitel Sarajevo, which was chosen as the best new hotel in the Alps Adriatic region among 10 shortlisted hotels. The Award was presented to Ante Marić by the President of the Hoteliers Association of the Croatian Chamber of Economy and President of the Association of Employers in Croatian Hospitality, Mr Ronald Korotaj. The opening of the exhibition "Illustrations That Tell Stories" took place on 28th September 2017 at the Oris House of Architecture in Zagreb. The exhibition was organized by Atellior with the support of the Büro 24/7 portal. The selector and the curator of the exhibition was Lana Petrak, architect at Atellior. Visitors had the opportunity to take a look at the works created as a result of the Snapshot series of interviews held by Lana and published from April to August 2017 at the Büro 24/7 portal. The exhibition consists of 50 illustrations that were part of the Snapshot interviews with 10 up-and-coming artists from Croatia and Serbia. The exhibition provides a brief insight and a glimpse into the artist’s character. The closing of the exhibition on Tuesday, 10 October 2017, will include a charity auction of the exhibited illustrations. All funds will be donated to Pragma, association that works on improving social and health care conditions of the socially deprived individuals in the city of Zagreb/Croatia. Oris House of Architecture is pleased to announce the opening of exhibition Illustrations on Thursday, 28 September at 7 pm, sponsored by Atellior, international architecture and interior design practice. The works on display are a result of a series of interviews called Snapshot interviews that were conducted from April to August 2017 in collaboration with the site Büro 24/7. The exhibition will be open to the public until Tuesday, 10 October. The author of the interview concept and the exhibition is Lana Petrak, architect and a member of Atellior team. Impression Magazine wanted to hear from designers about their thoughts on how the architecture and design community can create more value for their clients, therefore they held the interview with Una Barac, the Executive Director of Atellior. Global travel has evolved incredibly fast over the last decade. The bar has been raised on good design and this is now expected as the norm from all hotels. But savy travellers and hotel users want more from the amenities offered. Every segment of hospitality has to flow through and be intertwined with great atmosphere. There are some basics that every hotel owner, operator and designer needs to achieve. From a good shower and a comfortable night's sleep in even the most limited service hotels; through to amazing food and beverage, professional conferencing and enjoyable and relaxing wellbeing facilities in the full-service hotels. Some designers can go overboard with seeking to make grand design statements and this is where it can all go terribly wrong for the hotels. A good hospitality architect and interior designer knows that ergonomics and guest comfort must be at the forefront of every design. Basic as it may sound, form has to follow function. Hospitality design has seen a massive shift in the approach to public area space planning over the last five or so years. Open plan lobbies have become the focal point of all successful hotels. Lobbies are now completely open and integrated with the bar reception areas, have become places to meet, be it for work or pleasure. From early morning coffee and breakfast meetings, to working lunches afternoon tea, all the way through to dinner and cocktails; hotel lobbies are the heart of a good hotel, attracting their guests to stay, as well as attracting the passing trade to come in and use the facilities. A clear brief is the most important starting point of every good design, be it hospitality or any other sector. Some clients like to prepare a clear brief, whilst others prefer to develop it together with the designer. Both approaches will lead to success as long as the basic list of facilities, are laid out and agreed at the outset. Moving goalposts are the main obstruction to any project. Hence why it is imperative for the clients to know what they want from the outset, or work with their team of professional consultants to define those requirements as soon as possible.